Everyone loves the 1991 GMC Syclone, the all-wheel drive turbocharged six-cylinder muscle truck that was only sold in one color—black. Well it’s back, unofficially, through a tuner shop as a 455 horsepower supercharged conversion of the 2019 GMC Canyon pickup. You may recall Specialty Vehicle Engineering, the tuner that specializes in modifying General Motors vehicles, like the 1,000 horsepower Yenko Corvette sold through GM dealerships. Great news, they’re back with a muscle truck. The 2019 “Syclone” gets a supercharged 3.6-liter V6 engine up almost 150 horsepower from the standard V6 output. It’s limited to just 100 pickups through GMC dealers, and can be optioned as either two-wheel or four-wheel drive and with any of the standard Canyon factory colors (though really, it should only come in black). To properly balance the awesome power of the Supercharged 3.6L V-6, the SYCLONE includes a High Performance Brake Upgrade that features 6 – Piston Forged Front Calipers (stock is 4) in red, w/black SYCLONE graphics, and two-piece 13.6” diameter (stock is 12.2”) Slotted Front Rotors, to provide serious stopping power. Handling is enhanced by the addition of our Sport Suspension Package that lowers the truck 2” up front, 5” in the rear, and includes HD Traction Bars, HD Spring Bushings, Higher-Rated Front and Rear Performance Shock Absorbers, and a HD Rear Sway Bar. A Stainless Steel Cat-Back Dual Exit Exhaust System increases performance while providing a true sports car-like sound. 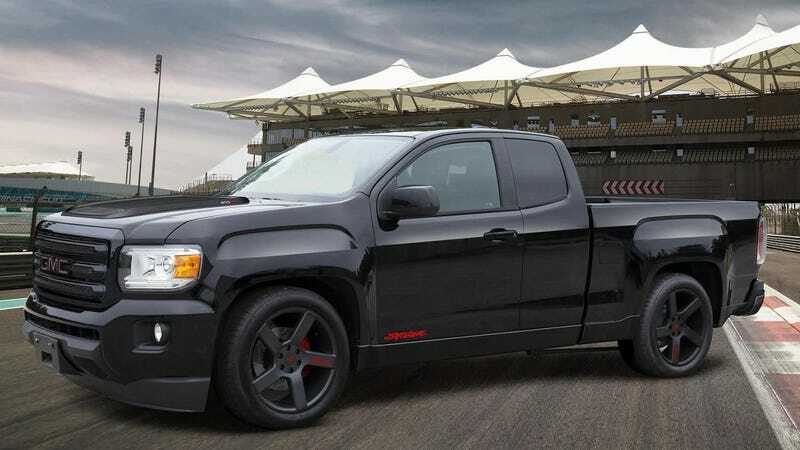 The truck also gets 20-inch wheels and some custom work inside, with a specialty Syclone seat trim and floor mats, as well as a numbered plaque on the dashboard and numbered keys, depending on where in line you placed your order. The major downside, apart from the 100-truck production run, is the price. The conversion is $39,995, and that’s on top of the truck itself. But hey, we talk a lot about Miatas and electric cars and all of that fun stuff quite a bit. Yet there’s something about a fast-as-hell pickup truck that awakens a very aggressive and very satisfying instinct in me.